← Small city, big impact: The leading eco-municipality of Bayfield, Wis.
Lawns in northern cities have to do more in a shorter growing season. That’s an unacceptable restriction for a lawn that roots for the Green Bay Packers. Lambeau Field celebrates its 55th year of Packers football in 2012. The team is owned by the city of Green Bay, population 102,726, and the Green Bay/Brown County Professional Football Stadium District. The 73,000-seat field has gone through many changes in the past half-century. Improvements have included the installation of heating coils under the field, additional seating and scoreboards, an atrium and grass-growing lights that sustain the storied, natural turf. Dutch firm S.G.L. 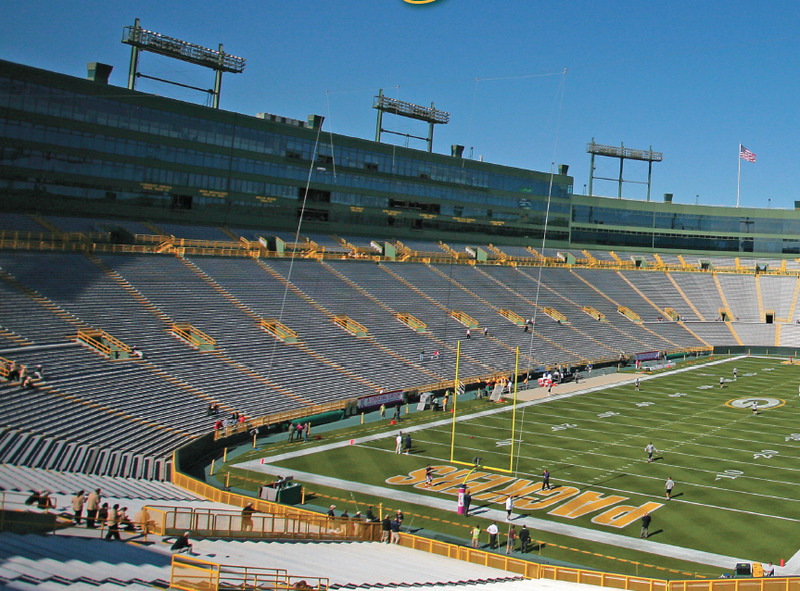 designed Lambeau’s grass-growing lights, called Stadium Grow Lighting. The artificial lighting system is made up of a complicated grid of retractable arms that hold hundreds of light bulbs. The Packers were the first North American team to experiment with these lights. The lights were first put out on one-half to one-third of the field in October of 2010 on an experimental basis. They worked out really well, and in 2011 the team bought nine units that are out from the beginning of October to the first week in December. “It takes about three full-time assistants to bring the lights out and then remove them from the field. Also when we mow or fertilize we move the lights from one half of the field to the other,” Johnson said. On a game day, the lights are completely removed. They fold in, accordion-like, and are moved quickly and easily. The benefits the lights have on the field outweigh a few minor issues the grounds crew experiences. Johnson noted that when the air temperature is below freezing, the lights can’t be used. Water, or rather spraying water, is another issue. The Packers are in the process of adding around 6,000-7,500 seats and two new scoreboards to the field. Some sunlight will be lost in the new construction area, so the lights will be used even more. Use of the lights might begin a little earlier, probably from September. Completion for the project is targeted for 2013. The lights are monitored daily when they are on the field. Data is collected on the lights in numerous ways, including a sensor on the top of the roof and a probe down on the field that measures air and soil temperatures. “Grass is trying to survive. It seeks sunlight,” he continued. The combination of a heat system and sufficient light, or a supplemental light source, works. The grounds crew, the players and Packers’ management are all very satisfied with how the lights perform. After the success with grow lighting achieved by the Green Bay Packers, other sports teams including the Houston Astros, the New York Red Bulls and the Seattle Mariners also installed the system.